Drawing upon Jasperson, Carter, and Zmud’s feature-centric view of technology (Jasperson, Carter, & Zmud, 2005) and Nahapiet and Ghoshal’s three dimensions of social capital factors (Nahapiet & Ghoshal, 1998), this chapter develops a conceptual model to elaborate the dynamic interactions between Social Network Services (SNS) features, social capital factors, and motivational antecedents on continuous participation in knowledge sharing activities among Online Social Network (OSN) community members. 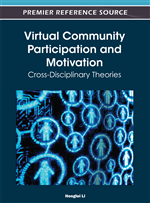 A number of SNS features, social capital factors, and motivational antecedents are set forth in this chapter. And the mechanism that links these factors is reviewed. It is proposed that, with embedded social mechanism, SNS features can strengthen motivations to continued participation through social capital facilitators. The rapid growth of Social Network Services (SNS) in the U.S. and around the globe has attracted millions of users who actively participate in all kinds of Online Social Networking (OSN) activities. For example, Facebook had 845 million monthly active users at the end of December 2011, and approximately 80% of these users were outside the U.S. and Canada (Facebook, 2011). These OSN users spontaneously form into large-scale groups (Waterson, 2006) who exchange information regularly via SNS platforms. These online groups become “online communities” when the interaction and togetherness between group members lasts long enough to form a set of habits and conventions (J. Lee & Lee, 2010). One of the major habitual and conventional activities among OSN community members is knowledge sharing through social networking services. A study in 2009 found that four out of five photos were located by traversing the social network links on Flicker (Mislove, 2009). This means that social networks have become the major venue for locating content. Thus the value of OSN communities, to a great extent, depends on the levels of member involvement and engagement in knowledge sharing activities (M. H. Hsu, T. L. Ju, C. H. Yen, & C. M. Chang, 2007). As a result, continued participation in knowledge sharing through social networking services becomes critical for the thriving of online communities. Continued participation in knowledge sharing through social networking services is not about initial adoption of SNS platforms, it is about people’s continued involvement in a complex IT platform post-adopting a core set of technologies for social interactions and information exchange. Previous studies have differentiated the continuance intention to Information Systems (IS) usage from initial adoptions (Bhattacherjee, 2001; Chiu, Hsu, Sun, Lin, & Sun, 2005; Hong, Thong, & Tam, 2006; Jasperson, et al., 2005; S. S. Kim & Malhotra, 2005; Limayem & Cheung, 2008; Limayem, Hirt, & Cheung, 2007). Built on these, researchers have highlighted the role of social factors in facilitating continuance intentions to participate in knowledge sharing in online communities. For instance, in community of transaction or community of consumption, there are factors such as sociability (Kim et al., 2008), shared vision and trust (Wang & Chiang, 2009); in community of practice, there are three dimensions of social capital factors (Wasko and Faraj, 2005; Chiu, Hsu et al., 2006); in professional virtual communities for expertise sharing, there are factors such as norms of reciprocity and trust (Lin, Hung, & Chen, 2009), and social interaction ties (I. Y. L. Chen, 2007). However, many studies have examined a complex information system as a whole, rather than looked into the feature level factors. Very few studies have explicitly investigated the relationship between certain features and user behaviors, for example, Xiao and Benbasat (2007) studied the relationship among recommendation agents use, characteristics and consumer decision making outcomes. In this chapter, we emphasized the importance of adopting a feature-centric view of technology (Jasperson, et al., 2005). Because users do not necessarily use the same information system although on the same SNS platform, in the sense that each of them chooses their own collection of social networking services and activities; online social networking becomes a routine for OSN members while the relationship between SNS features, social interactions, and motivation to participate in knowledge sharing activities is still unclear. In order to conceptualize social interactions, this chapter adopts a social capital perspective, since the social capital theory provides a multi-dimensional view of social interactions which will allow us to form a bigger picture.